HTE Compressed Air Solutions specializes in oil free air compressors and their complete systems. Sizes vary from simple 5 hp single oil-free piston compressor installations, to multiple machine configurations involving both centrifugal and oil-free rotary screw compressor technologies at power, food, beverage, packaging, pharmaceutical, and biotech plants where air demands can exceed 5,000 hp. Backed by Atlas Copco compressors and products, the first compressor manufacturer to meet the industry’s latest Class 0 ISO 8573-1 (2010) oil-free standard, HTE Compressed Air Solutions is the region's only supplier of comprehensive oil free compressors. HTE’s oil-free compressor air team focuses on your most demanding clean air requirements with oil-free rotary screw, scroll, piston, and centrifugal compressors. We work with laboratories, pharmaceutical manufacturers and packagers, prescription dispensers, food processors and packagers, and customers in many other industries to provide them with oil-free compressed air. Save almost all your air dryer energy costs by using the heat of compression rotary drum dryer with your oil-free air compressor. Click here for information on these high value dryers. Give us a call at 800-444-4831 to schedule an on-site visit and system evaluation. Or, simply click here and send us an email. We will be back in touch with you shortly about your oilless compressor needs! The process starts with a thorough evaluation of the condition of an existing system to determine the cost-benefit tradeoff of continuing to repair the older unit(s) vs. selecting a new compressed air system. We will also review ways to improve downstream air quality using dryers and proper filtration. HTE's Energy Audit program provides you with a detailed report on where you have lost energy efficiencies as your plant has grown or changed. Our compressed air team includes multiple U.S. DOE Qualified Air Master + experts to make sure you get the very best support with your project. Ask about the availability of Energy Incentives for the purchase of higher efficiency equipment! 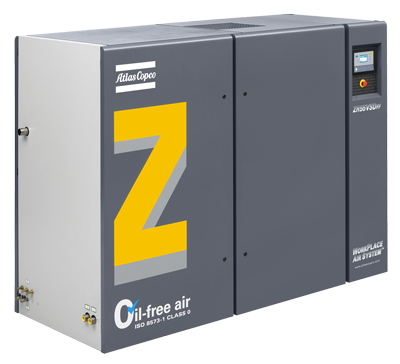 HTE Compressed Air Solutions supplies and supports oil-free compressed air equipment solutions from Atlas Copco, the first compressor manufacturer to meet the industry’s latest Class 0 ISO 8573-1 (2010) oil-free standard. There is no other manufacturer in the world that comes close to rivaling Atlas Copco’s oil-free compressed air capabilities. Go with the leader! Our extensive inventory of compressors, dryers, accessories, parts and lubricant allows us to respond quickly to your urgent compressed air needs. Do you need additional oil-free air capacity while you repair, maintain, or overhaul your old compressor? HTE Rental Services is here to smoothly support you during this transition. HTE Compressed Air Solutions provides Atlas Copco Oil-Free Compressed Air Systems and Services in Kansas, Missouri, and Illinois.